I'm back! 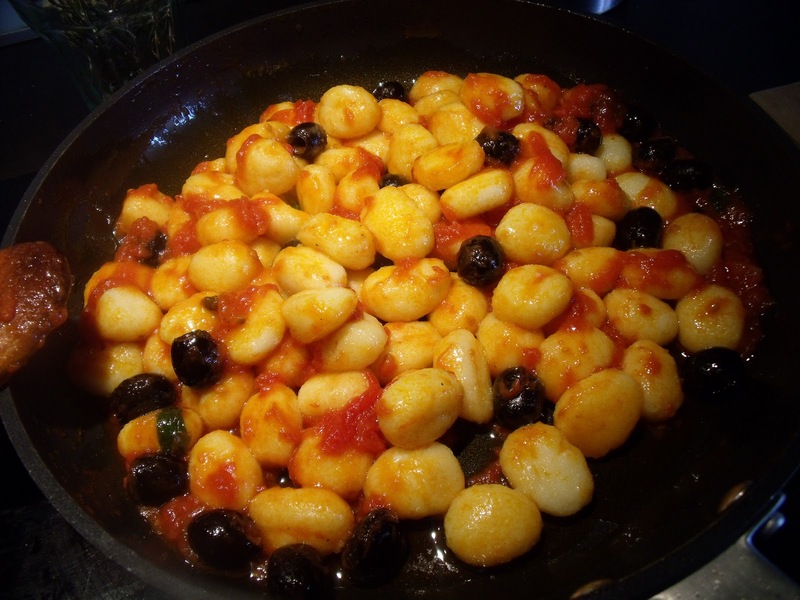 Antonio is back from his visit to the States and today I asked him what he would like for lunch and he said - Gnocchi alla Sorrentina. 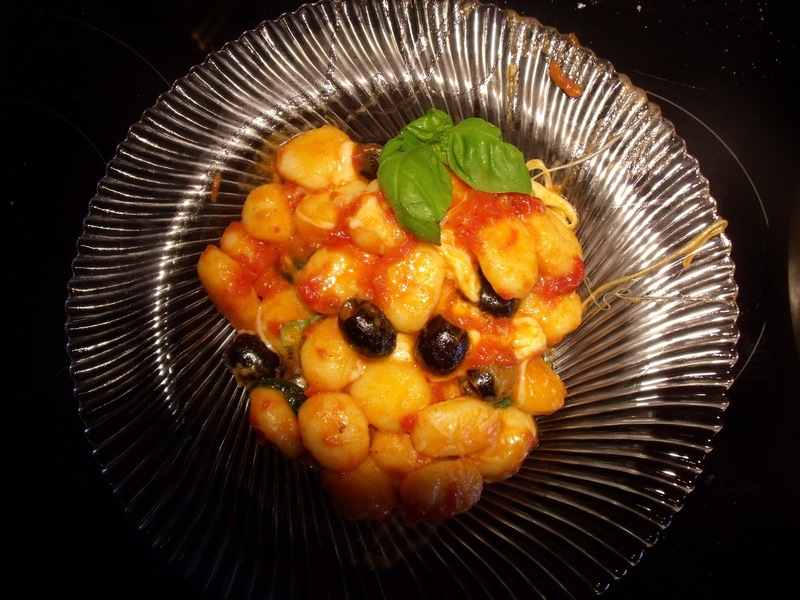 I first tasted this recipe when our first "pizzaiolo" (pizza man) at Tre Pozzi (the restaurant I ran) made it for the staff for dinner one of the first nights he was there. I have since seen it in other restaurants and I have read different recipes, but his remains my favorite! If you have the time, make homemade gnocchi - they melt in your mouth! Otherwise, do like I did today and buy them at the supermarket! I don't know if they really make gnocchi this way in Sorrento, but they do come delicious! So here we go with the recipe! You may ask why I always make my sauce in a frying pan and not in the classic sauce pan. Simple, it cooks faster, there is a larger heated surface and the food cooks faster. Since I am always in a hurry, time is of the essence!! 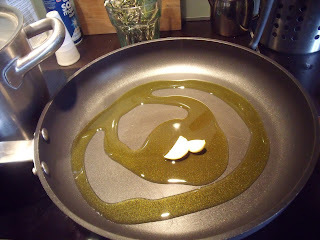 Ok, let's make the sauce..
Heat a couple of tablespoons of extra virgin olive oil in a large fry pan, add a couple of peeled garlic cloves and let them sauté for a few minutes. 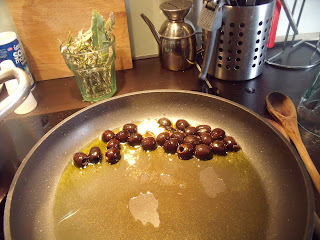 Crush the pitted black olives in your fist and add to the hot oil and garlic. Sauté for several minutes. 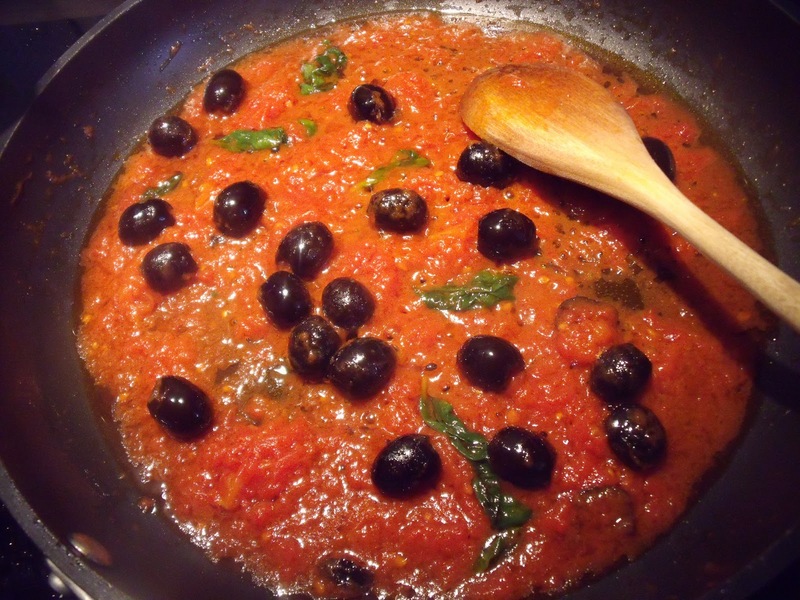 In the meantime, open the can of tomatoes, pour them into a shallow dish and break up the tomatoes with a fork. 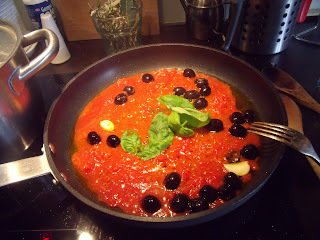 Add the tomatoes and basil to the pan. Salt and pepper to taste, lower the heat to medium, cover and cook for about 10 minutes, stirring occasionally. While the sauce is cooking, bring a large pot of water to boil. 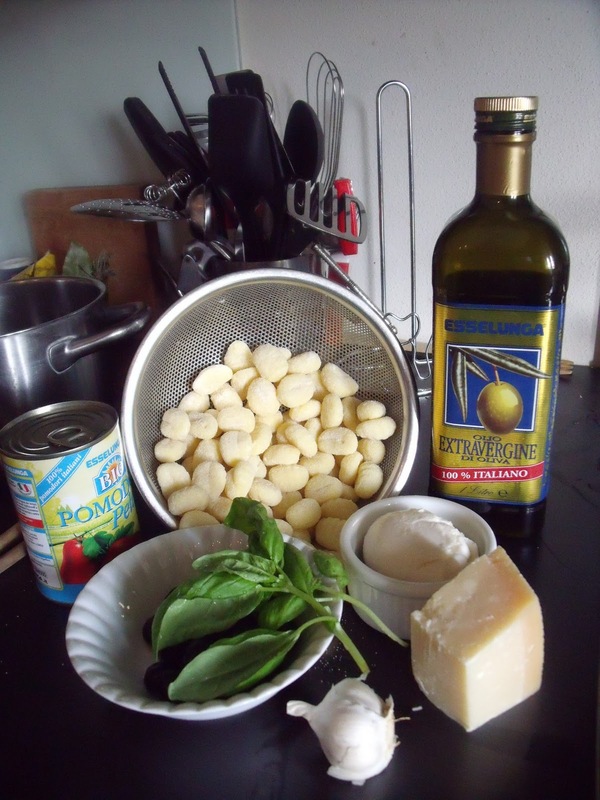 Coarsely chop the mozzarella and grate about 1/4 cup of Parmesan cheese.You should also have time to wash up the dishes and utensils you used to make the sauce. 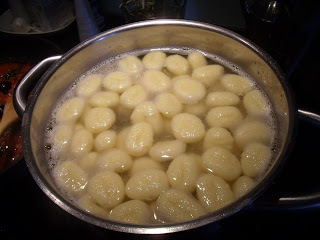 When the water comes to a boil, put the gnocchi in to cook. They will only take a couple of minutes. 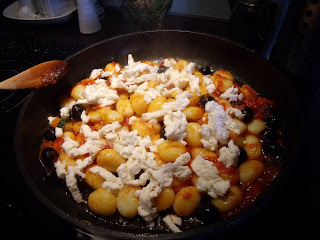 While the gnocchi are cooking, remove the lid from the sauce and lower the heat. This is what it should look like after about 10 minutes of cooking. 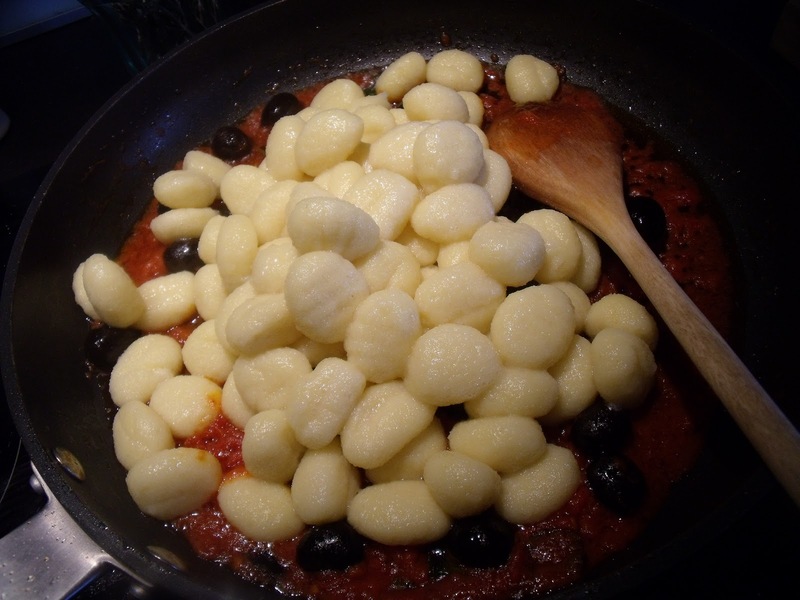 When the gnocchi float to the top they are cooked. Carefully remove them from the water with a slotted spoon. If you drain them in a colander be careful because they break up easily. 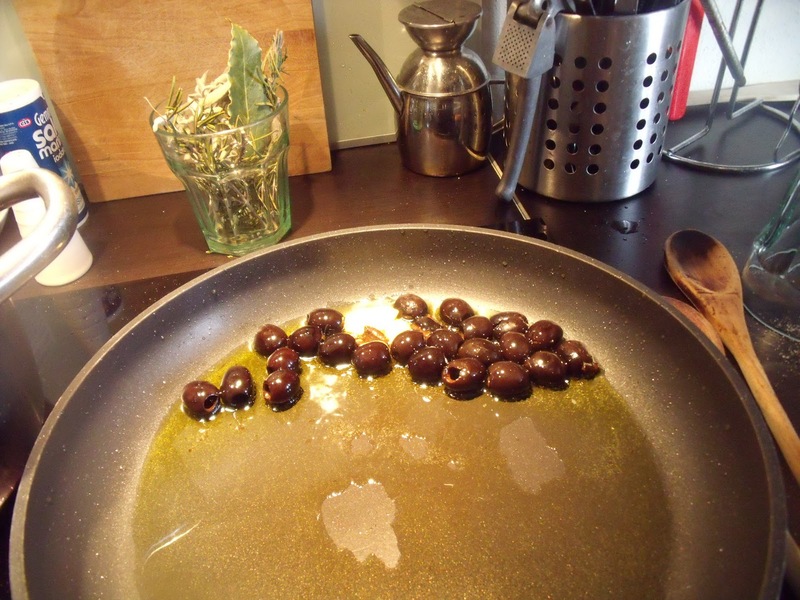 Put the gnoocchi directly into the sauce as you remove them from the pot and drain them with the slotted spoon. Gently toss the gnocchi in the pan so that they are coated with the sauce. If you can do this without the help of a spoon, your gnocchi will remain whole. If you can't toss them by making them "saltare" in the pan, the gently fold them into the sauce with a rubber spatula. Add the mozzarella, cover for a minute or two so the mozzarella melts. Sprinkle with the grated Parmesan and garnish with fresh basil leaves. That's it! Serve them while they are hot. I guarantee that you will have no leftovers! Kids love this recipe! I think it's already pretty much low fat! 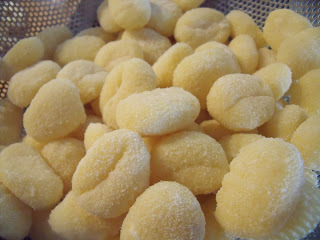 my gnocchi recipe is just potatos and flour, no eggs so there is no fat! It was published in the Philadelphia Daily New back in June of 2006. Here it is. 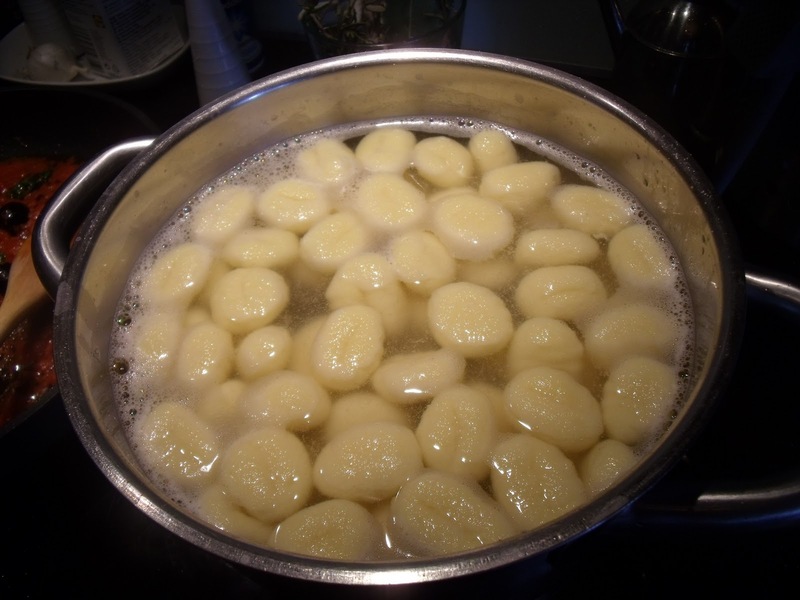 Toss into boiling water, when they come to the top they are done. let me know how it comes! Jas and I are drooling on the computer screen for this one. Wow Donna! Beautiful. Donna, you are living my dream! Lucky you. 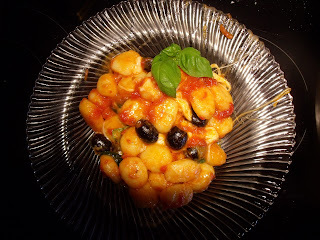 Just found your blog today, after returning from Lucca last week, and still tasting the incredible gnocchi with gorgonzola we had for lunch at L'Oste de Lucca. 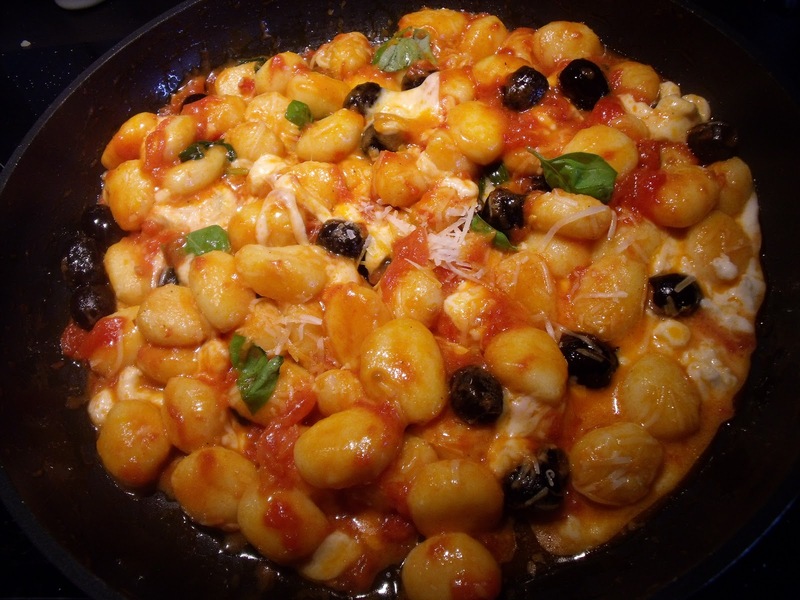 I guess I've never had homemade gnocchi before, as it just melted in my mouth! So, I've become inspired to make it myself. I'm wondering if you have a recipe for the gorgonzola sauce? Any tips you can pass along will be greatly appreciated. I shall continue to follow your blog... your recipes are wonderful. thanks for you comment! If the truth must be told.. Gorgonzola sauce is very, VERY simple!! 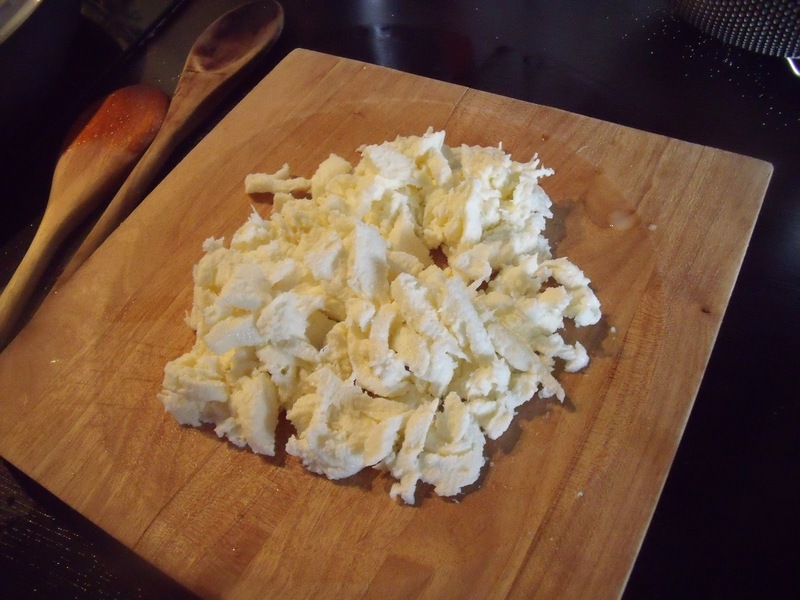 you just melt your gorgonzola cheese over low to medium heat in a large non-stick frying pan, you can add a bit of light cream if you want a more liquid sauce. Then when your gnocchi (or ravioli - meat or ricotta and spinach both delicious with gorgonzola cheese) are cooked, just drain and put them right into the frying pan. 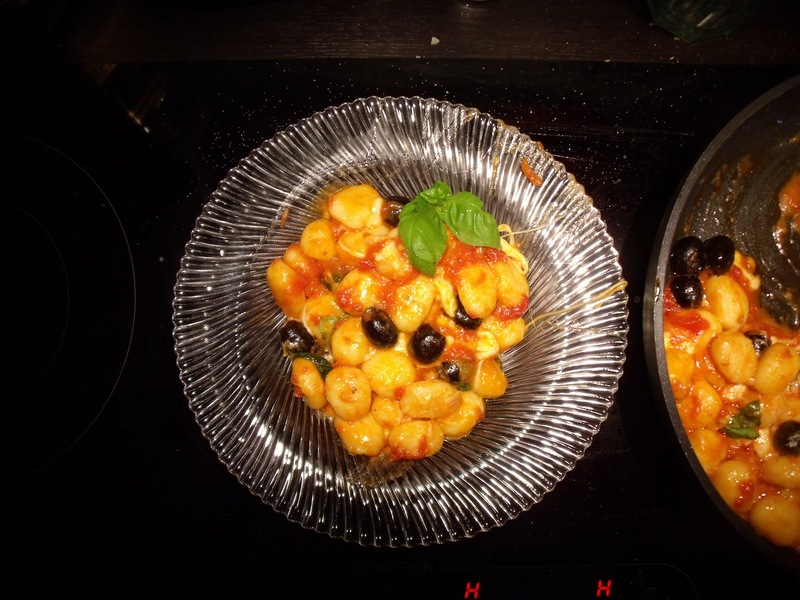 stir gently with a wooden spoon so that all of the pasta is coated and serve! that's all there is to it!! You can also add chopped walnuts to gorgonzola sauce for a nutty, crunchy addition! Buon appetito!